What a terrible blog post title... give me a break. 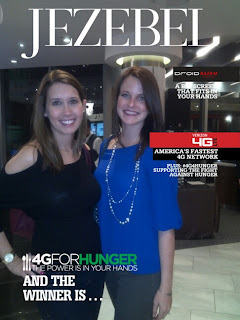 That evening, I attended the Verizon 4G4Hunger Reveal Party at the Sub-Zero Wolf Showroom. (Click here to learn more about the campaign.) I brought Alysa as my date and we had a great time mingling and eating some yummy food. The best part of the night came around 8pm, when they announced the winner of the Challenge. I honestly felt like I was in the Miss America Pageant... they started with 3rd runner up and worked their way up, and I stood there with my camera ready and fingers crossed. (I honestly would have been happy no matter what - the winner was donating to their hunger charity of choice, so there wasn't really a loser.) When they announced the first runner up and it wasn't Chef Mike, I frrrreaked! WE WON!!! Thank you and congrats to Chef Mike of Del Frisco's Grille for winning the challenge, thus gifting Share Our Strength $4,000! Keeping the celebrations going, Adam and I spent the weekend celebrating two Alysa's birthday! First up, Alysa's 25th! Adam and I treated her to a drink at Del Frisco's Grille (we had to go congratulate Chef Mike...again! ), and then a group of us went out to the Dark Horse Tavern in the Highlands. We always have such a fun time with our crazy group of high school friends! On Saturday, we headed over to my aunt and uncle's house (which we learned is only 5 miles from our new house) for Aly's 4th birthday party. Aly was our flower girl, and we just love watching her grow! She was just a shy barely-two year old in the wedding, and now you can't shut her up! She is one of the funniest little kids and we love her. She had 4 wardrobe changes in a 3 hour span - my girl. For her birthday, I got her some Disney Princess stuff - very relevant since it was a Disney Princess party - and a wine glass. A wine glass for a four year old? WHAT? Well, when we were over there in the fall, Aly came storming into the kitchen demanding "wine in a glass". Turns out her parents let her have Kool Aid in a wine glass so she can feel fancy, so Adam came up with the cute idea to make her one! She loved it! She didn't love any of her presents as much as she loved Adam. He is the cutest with kids and it just melts my heart. Most definitely going to be the best dad, ever. SIDE NOTE (this is kind of becoming a normal thing, isn't it? ): Adam and I started our "lifestyle change" last week... no drinking on weekdays, eating clean(ish) and doing the same transformation workouts he did last year. If you know me, you know I love having a drink everyday after work, but it honestly hasn't been too terrible! In fact, I kind of love it. It's so much easier to get up in the morning (520am...barf). I totally don't party every night, but even just not having that one drink at night makes a huge difference. Overall, it's really been pretty great because we haven't been depriving ourselves, we've just been eating healthier and in moderation. In one week, we've already seen pretty rad results.